All materials have inherent flaws that would eventually lead to failure with prolonged usage. It is essential, therefore, to develop and refine methods of detecting and monitoring these flaws. Effective monitoring would help not only to detect a flaw before it results in a catastrophic failure, but also to extend the functional life of the material through preventive maintenance wherever possible. Cracks are one of the dominant forms of flaws that affect all materials. It is vital, therefore, to develop and refine methods to detect and monitor the birth and development of cracks in materials employed in structural applications. In order to do this effectively, the material in question has to be studied thoroughly to find out how it behaves in specific applications, various conditions and over different extents of time. This can be a slow, time-consuming and expensive process as it involves repeatedly testing the material to find out its inherent strengths and weaknesses. Unfortunately, the technology for monitoring materials usually lags several steps behind that for practical applications for these very materials; after all, the prevalence of any material in structural applications has to reach a critical mass before the peripheral technology for monitoring and managing that material can become economically and financially viable. The lag becomes even more pronounced every time there is a generational shift in materials used in practical, everyday applications. The times that we are living in, in fact, are witnessing just such a shift in the kind of materials employed across a wide range of applications. For the longest time, metals and their alloys held sway over practically the entire spectrum of practical applications. However, they are being displaced by composite materials in almost all the areas in which they were once considered irreplaceable. A case in point is the transport industry. From bicycles to airplanes, every latest model has a larger proportion of composites compared to conventional materials like metals and alloys, because the transportation industry is always looking for ways to maximize the ratio of payload carrying capacity in relation to overall structural weight. Composites are increasingly being used in applications where strength-to-weight ratio is a crucial factor. 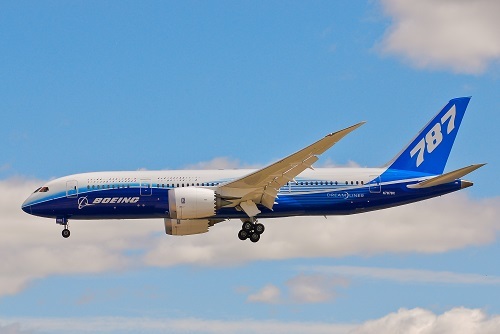 The revolutionary design of the latest Boeing 787 Dreamliner uses composites that make up 50% of its structure, including fuselage and wing, which increased its fuel efficiency. However composite materials, unlike metals, do not show visible cracks under fatigue. 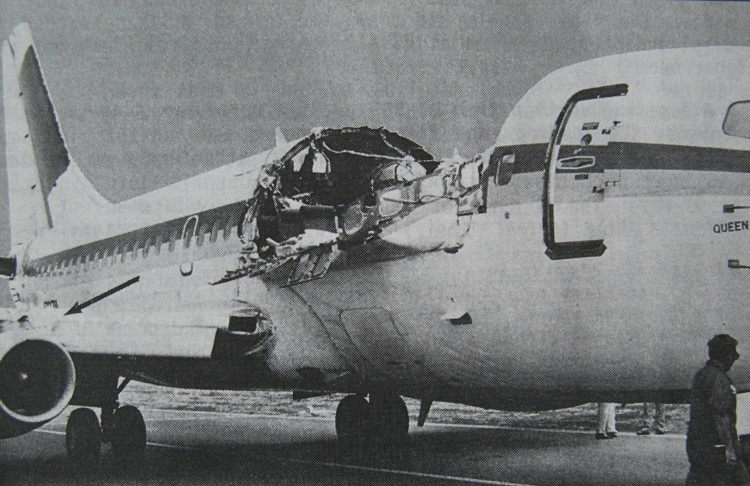 Consequently, any failure would be catastrophic in nature which raised concerns on the safety risks. It is a matter of life and death, therefore, to detect fatigue in time to make sure that it doesn’t lead to failure. However, while the technology for manufacturing using composites has been growing in leaps and bounds, that for monitoring, modeling and predicting material fatigue and failure has been lagging woefully behind. However, using computational and modeling methods, it is possible today to bridge this gap more quickly today than in the past when conventional methods had to be relied upon. 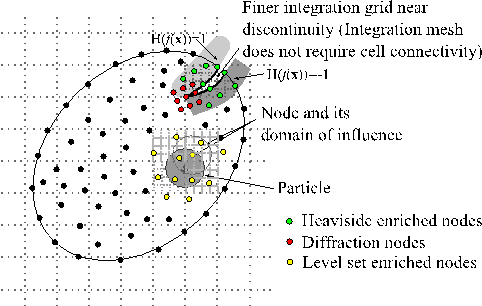 Mathematical techniques like finite element method (FEM) and boundary element methods had been used extensively to model the crack propagation in the last generation of materials such as metals and alloys. These methods had proven themselves to be efficient and effective in their time, although they did bring with them their own challenges like conformal meshing and extensive re-meshing when it comes to modeling crack propagation. This process is challenging, computationally costly and time consuming. This led to the development of eXtended finite-element method (XFEM) and meshless methods (MMs), which overcame these shortcomings. Currently, MMs find its usage for modeling damage in homogenous, functionally graded materials and bi-materials. Its usage in composite materials and multi-crack materials are limited. Stress intensity factor (SIF) is a characteristic parameter of a crack in a material. The post-processing techniques to find stress intensity factors (SIFs) within the framework of MMs are not as wide as in FEM. A major leap forward in authentic virtual testing of materials would be the development of robust numerical tools for modeling damage in high-end industrial materials such as composites. 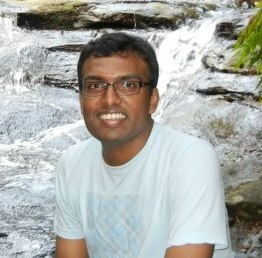 At the IITB-Monash Research Centre in Mumbai, Research Scholar Nelson Madalai Muthu has been working on developing such tools. Under the guidance of Prof. S.K. Maiti, Prof. Brian G Falzon, Prof. Wenyi Yan, Nelson has been developing a meshless technique that will enable effective and reliable modeling of damage in composite materials based on linear elastic fracture mechanics theory (LEFM). His work has also resulted in improving the utility of the existing method for applications involving cracks in homogenous, functionally graded materials and bi-materials. He has chosen to develop and refine a meshless model that will effectively address the requirements for predicting material fatigue and failure in relevant industrial applications.